Note: I got to see a few of these new classics in person last week at my dear friends’ beautiful shop in Asheville, NC. If you’re nearby, stop by the Baggie Goose! As I wrote this time last year, Halloween is a serious affair at Rosa’s elementary school. This is her final year there and she wants to go out with a bang. It’s amazing to see how far her thinking on the subject of creative costuming has become. This year’s idea was pretty meta. For the past two years, Rosa and Cora have worn related costumes. 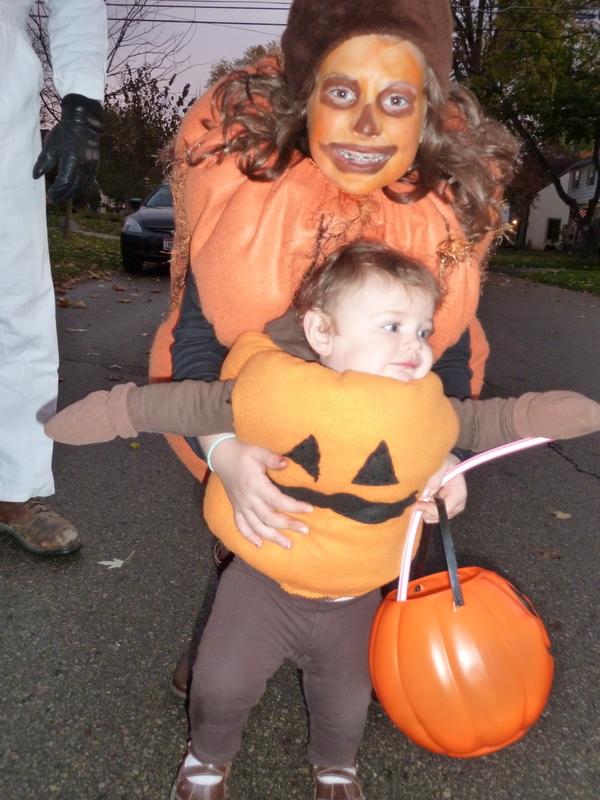 Three years ago, Rosa wanted to be something BIG, so she and her mom cooked up a giant jack-o-lantern for her to wear. Since I hadn’t had any brilliant ideas yet, and the costume looked nice and warm, I used some of the extra orange felt from Rosa’s costume and a piece of foam I had lying around to make something similar for Cora. In homage to Rosa’s obsession with mustaches, I gave Cora’s gourd a furry upper lip. Last year, I was inspired by this tutorial for the most gorgeous DIY wings I’ve ever seen. Again, looking at fabric hanging around in my stash, I decided to make two sets of wings, one for me and one for Cora. I also made some masks and we were transformed into owls. I attached the wings to sweatshirts to make them easy to get on and off and to keep us warm (notice the trend here?). A week before Halloween, Rosa hadn’t decided what to be. She tried on my wings and begged to wear them. How could I say no? I was honored they would be part of her school’s annual costume parade. So, we headed to the thrift store, where she found and fell in love with a gorgeous Betsey Johnson dress with the tags still on. Price = $89.95. Rosa was floored. “How could they charge so much? It’s the thrift store!” So, we talked about non-profit organizations and their need to make money and the fact that while this seemed expensive for Volunteers of America, really the dress was a bargain. If she were 5 years older and headed to the prom, I would have snatched that thing up in a heartbeat. But, it was Halloween, so I suggested we examine the dress, think about what made her like it so much and a) look for something similar but less expensive, or b) try to recreate it ourselves. Of course this didn’t go over well because what Rosa wanted to hear at that moment was that she could have the dress. And if I were made of money, I would have said yes. Like I said it was a beautiful dress the purchase of which would surely have won me some stepmom of the year award. But I’m not made of money and I recognized this as a teaching moment. I reminded her of the fashion camp she attended this summer and asked, “What would Jen Gillette do?” Jen was Rosa’s instructor for Fashion Blasters – a tall blonde who greeted the kids on the first day with her hair teased out and up like a runway model, wearing an outfit she’d made of found materials held up by super high platform shoes she’d bedazzled from top to bottom. She’s gone to study theater design and production at Tulane, but her spirit lives on in Columbus through the folks she inspired during her time as a Creative Consultant at the Columbus Museum of Art’s Center for Creativity. Including me. We put our heads down and went back to the racks. I found a hot pink cotton tube dress the top of which was a lot like the Betsey Johnson design. Rosa found some curtains that were made of a similar material as its skirt. At home we talked about how to put them together. I’ve always been hesitant to sew clothes – I’m not precise enough to make things fit – so I was proud of myself for figuring out the sewing aspect. But I was sad that Rosa didn’t feel confident enough to help me. I powered through on my own. And then I realized, While Rosa wasn’t doing the sewing, this experience gave her an opportunity to spiral back to creative thinking and problem solving skills she learned this summer. And, as I reminded her to do so, I was practicing those skills too – setting a challenge and figuring out a way to address it. 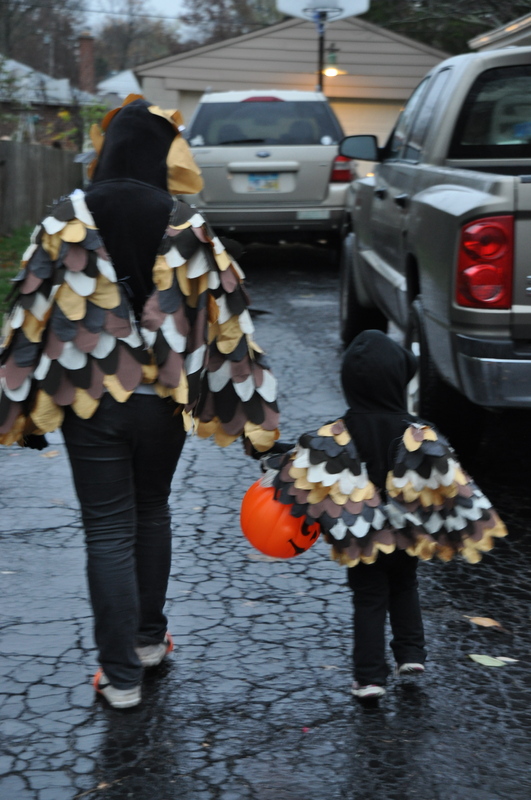 Are your Halloween preparations presenting any creative challenges to you and your kids? I’d love to hear about them. You’ll see ours in a week. Sorry, no peaking. One afternoon last spring, I updated my facebook status to read, “Planting seeds is the greatest act of faith I know.” The words just kind of flew from my fingertips. It wasn’t a thought I had consciously nurtured for any length of time. It just felt true to my experience. It really seems magical how you put these teeny tiny things in the ground and they grow to be bigger, in some cases enormous, things with just a little sunshine, water, and time. The element of time is the most elusive, and possibly most important, ingredient in this equation. I didn’t realize until just now the impact that story had on me. But, I like to think I honor its spirit both in my own work in the garden and by teaching my kids to appreciate the power of such actions. When we work the land, we are working for ourselves and for those who come after us. Yesterday Cora and I planted some spring-flowering bulbs. She did an incredible job following each step of the process and even developed her own system for evenly distributing the different varieties among the containers. Then she went to the rain barrel and filled her watering can. I nearly melted into the ground. It reminded me how capable three-year olds can be when given a chance to do something real and meaningful. It’s no wonder there are so many Montessori schools with gardens. Together, we put the containers in the shed and covered them with a burlap blanket. She knows they will spend the winter there, I’m just not sure she knows what will happen next. That’s where the wonder, and magic, come in.